or wanting to deepen your yoga practice and knowledge. 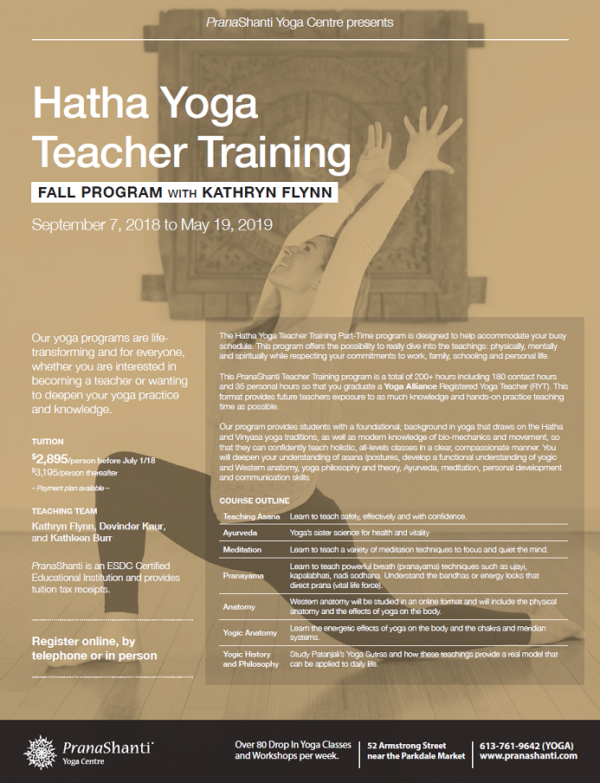 The Hatha Yoga Teacher Training Part-Time program is designed to help accommodate your busy schedule. This program offers the possibility to really dive into the teachings: physically, mentally and spiritually while respecting your commitments to work, family, schooling and personal life. This PranaShanti Teacher Training program is a total of 200+ hours including 180 contact hours and 35 personal hours so that you graduate a Yoga Alliance Registered Yoga Teacher (RYT). This format provides future teachers exposure to as much knowledge and hands-on practice teaching time as possible. Our program provides students with a foundational; background in yoga that draws on the Hatha and Vinyasa yoga traditions, as well as modern knowledge of bio-mechanics and movement, so that they can confidently teach holistic, all-levels classes in a clear, compassionate manner. Our program will deepen your understanding of asana (postures, develop a functional understanding of yogic and Western anatomy, yoga philosophy and theory, Ayurveda, meditation, personal development and communication skills. The course requirements include research presentations, a yoga class journal, and active participation in the classroom. The format of the program is comprised of Monday evening lectures, weekend lectures, an online anatomy course, self study and public yoga classes at PranaShanti Yoga Centre. Friday 6 pm to 9:30 pm, Saturdays and Sundays, 11;30 am to 6 pm each day. Complete homework (reading, writing, practice teaching with each other/friends/family) between group meetings. Prepare your yoga research presentations and complete your yoga class journal for each of the 30 yoga classes you attend. Participate in our online anatomy course. Choose from over 90 classes per week to practice and observe various different teachers, teaching and yoga styles. Please contact us with any questions and we can also arrange a date and time to meet one-on-one to discuss the program. Teaching Asana – Learn to teach safely, effectively and with confidence. Meditation – Learn to teach a variety of meditation techniques to focus and quiet the mind. Pranayama – Learn to teach powerful breath (pranayama) techniques such as ujayi, kapalabhati, nadi sodhana. Understand the bandhas or energy locks that direct prana (vital life force). Anatomy – Western anatomy will be studied in an online format and will include the physical anatomy and the effects of yoga on the body. Yogic Anatomy – Learn the energetic effects of yoga on the body and the chakra and meridian systems. Yogic History and Philosophy – Study Patanjali’s Yoga Sutras and how these teachings provide a real model that can be applied to daily life. At PranaShanti, our Teacher Training team are all Yoga Alliance certified at the 200 hour or 300 hour level. Our Teachers range from all traditions of yoga and are committed to your study and learning. We offer an Assistant Program as part of our trainings so 200 hour level Teachers can continue to hone their skills in the training environment and be of service to the teachers-in-training. See below for more details about your teaching team for this program. Kathryn is an old soul – a smart, warm, and occasionally humorous yoga teacher living in Ottawa, Canada. Recognized for her articulate and thoughtful voice in writing and teaching on yoga, Kathryn is known for weaving together philosophy, anatomy and Ayurveda (yoga’s lifestyle science), illuminating the complexities of these fields for practitioners and teachers alike. Students of many generations call her their teacher, drawn to her inclusivity and authenticity. In classes, students are drawn to the atmosphere Kathryn creates that results in an efficient yet calm practice. In workshops and trainings, participants learn just how detailed the depth of her methods go. Seeing a need to help teachers hone their skills as facilitators, her trainings focus on refining information and practices so that we all continue to progress as students and teachers. Kathryn is a 500 RYT certified teacher of Ayurvedic Yoga, Honours Bachelors of Arts, and Masters of Arts in English. Payment Plan: Deposit of $500.00 + HST plus 7 monthly payments (September 2018 to March 2019) of $442.14 + HST. All payments to be complete before the course concludes. Hold your space! A $500.00 non-refundable deposit is required to hold your space in the program. During training students receive 10% off purchases at PranaShanti for such items as CD’s, books, manuals, clothing, yoga mats and bags. Register Online, by telephone or in person. There is no refund for the $500.00 deposit. Refunds for the balance of the course fees (minus a $500.00 Administration Fee) are available up to 5 days before the starting date. 10% discount for full time students, seniors and military. Payment plans and 1 Scholarship are also available. Minimum Registration is 12 students, maximum registration is 25 students. Although every effort is made to maintain consistency, faculty may be subject to change. We believe in the highest quality and caliber of training so that every student receives the time, focus and dedication of the trainers that is needed to create a solid foundation for practice and teaching. Although every effort is made to maintain consistency, trainers, guest speakers and faculty may be subject to change. PranaShanti is an ESDC Certified Educational Institution and can provide tax receipts for qualifying trainings. “If you want to learn something, read about it. If you want to understand something, write about it. If you want to master something, teach it.” -Yogi Bhajan.